Mr. Stark is the president and chief executive officer of Stark Capital Management. His previous experience specialized in the management of domestic and international portfolios for individual and institutional clients. He prides himself on long-standing relationships with his clients, distinguishing himself and his team by living up to his philosophy of "providing the best possible service and attention to detail while working to fulfill his individual clients' investment objectives." Drawing on more than 50 years of experience in the investment industry, he makes himself readily available to his clients and ensures consistency in investment and operational processes in the firm. His prior experience includes his role as senior vice president of Drexel Burnham Lambert Incorporated, manager of its Houston branch office and Southwestern regional manager of institutional sales. 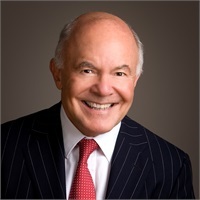 From 1967 to 1977, he held senior managerial positions in international and U.S. institutional sales at White Weld & Co.
Mr. Stark has been active in numerous civic and charitable organizations, including his alma mater, Cornell University. He received his MBA from the European Institute of Business Administration (INSEAD) in Fontainebleau, France. In 1997, he was elected Chairman of the District Committee and District Business Conduct Committee for NASDR (District 6) which regulates the 341-member firms in the securities industry in Texas.